The Yugoslav period, also for Kosovo and Mitrovica especially, was totally different from nowadays, since in the Fifties, for example, also teachers coming from Russia went to teach in Serbian schools and gave lessons on many different subjects and there was a very wide openness to international situation and world cultures; also, in the following times, teachers from other countries also arrived, and you can imagine how the cultural situation and the educational environment were rich and completely different from nowadays. Now, you don’t have many inter-ethnic and inter-cultural areas in Kosovo and, in a very meaningful place like Mitrovica, you can find Bosniak Mahala, which is a very sensitive place for inter-cultural and socio-economic exchange. You can find Serbian speaking owners or businessmen with Albanian customers and, in the same time, Albanian speaking ones who have Serbian customers, so they have a lot of exchanges on different levels. It’s like a social base, having these activities, for cross-cultural dialogue. Relying onto traditional cultures or unwritten rules, they are not obeying sociologically, to a “formal” or “outer” authority; they have their own circuit, their own system of relation, quite a specific “state” in the “city”. This is the situation in general; more than one thousand people are there, and we have now Albanian businessmen opening new trade centres, in Bosniak Mahala, with Serbian and Albanian people working there together. We have also a bakery, well known in the entire Mitrovica, which, in Ramadan time, uses to issue a traditional bread, called “pitahania”, which is asked also by Serbian speaking customers, because it’s very characteristic in that time of the year; and you also have some Serbian friends who use to buy bread or stuff like that. It’s the same for some kinds of traditional coffee-shops where, also for the traditional beverages they serve – mostly the traditional liquor called “rakija” – you can find Serbian friends, close to each other. In a sociological way, you can face a sort of “human rights based behaviour” in Bosniak Mahala. As you see, the conditions for a rehabilitation, re-composition and reconciliation, in Mitrovica and generally in Kosovo, are mostly based on socio-economic development and cross-cultural exchange. Also this acquaintance with relationship and friendship among ethnicities and communities is based on the ordinary exchanges in everyday life and on a sort of “unwritten rule”: they somehow know where to step and where not. 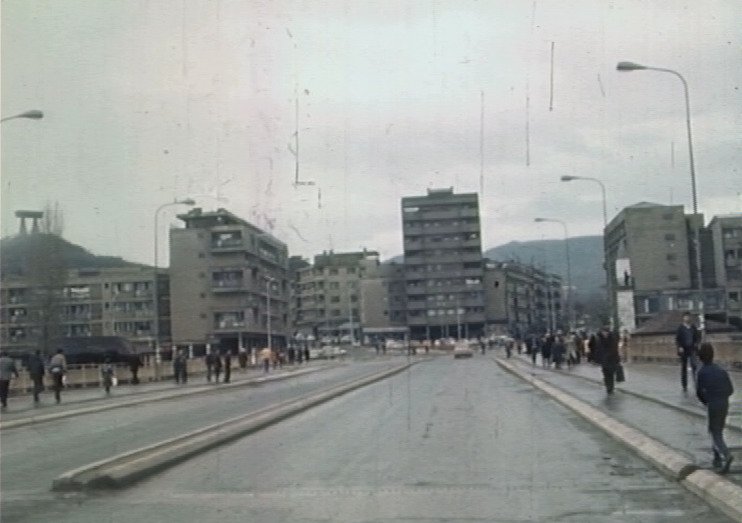 After 2004 riots, some Albanians sold their homes and Serbian authorities started building new flats in Bosniak Mahala, to give new opportunities for displaced people and to re-structure the ethnic balance of the area. You can also see Albanians building and renovating their houses, with a positive response as well from Serbian authorities, just because the situation there is quite relaxed, different from that in Kodra or Three Towers. If you have, in Bosniak Mahala, houses after houses, anyone is very close to each other and, in some cases, have a long time acquaintance with the “other”. The situation is different elsewhere, since in Kodra you have just a small group of Albanian houses quite completely surrounded by Serbian houses, while in “Three Towers” the ethnic composition is at “floor-based” level, so you have one flat or one floor with Albanian families and three, four, five more flats or three, four, five more floors with Serbs. Many organizations and institutions, for the same reason, have their representation office in Bosniak Mahala, as it’s conceived, especially by “internationals”, like a sort of “middle zone” between the North and the South: for example there’s a KPS (Kosovo Police) block-post, managed by the North Police District, whose district commander is a Serb, but where Albanian and Serb police officers work together, for security reasons, after 2004 riots, to preserve a sort or “relaxed specificity” of that multi-cultural neighborhood. Bosniak Mahala is a base to explore a formula for co-existence. You don’t have any lamp genius to ideate the perfect formula; but anyone found such a way to live together, and this original way is based, essentially, on the “reciprocity of needs”: as one needs the other to buy something or to live closely as “neighbour”, the other needs you as well to manage a business or to save a property. Finding shared solutions to common problems. Everybody, coming in Kosovo, want to visit Bosniak Mahala, to figure out the way how the inter-communitarian situation can improve, or just to manage an issue or develop a business. It’s a sort of customary free zone: Albanian businessmen open their business according to Kosovo regulation and pay taxes to Albanian office, Serbian businessmen open their business according to Serbian regulation and pay taxes to Serbian Government. They need to have this kind of benefit from that area, in terms of relax and contact, safeness and good relations, and this is based on social, familiar and economic reasons. Such reasons are based on the very fundamental issues and topics of the everyday life.